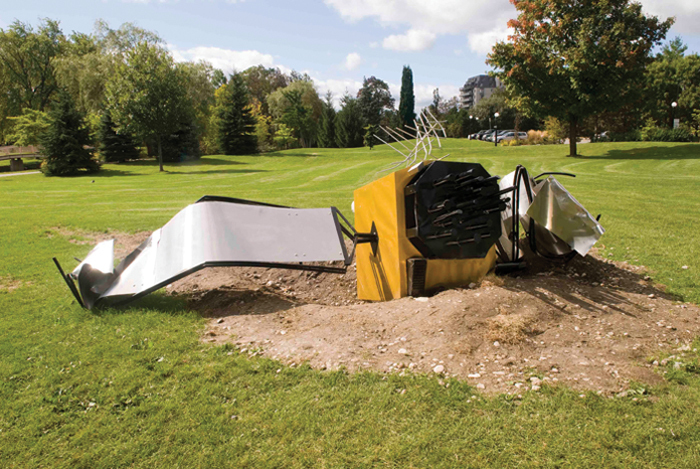 Brandon Vickerd (Toronto, ON), Satellite, 2009, sheet metal, 4.50 x 1.22 x .91 m., Victoria Park, Kitchener. Photos: Elizabeth Feryn. Satellite is a full-scale replica of a Global Positioning Satellite which appears to have fallen to earth -- an artistic statement intended to question the authority granted technology by confronting the viewer with a narrative that highlights the failure of scientific knowledge. The sculpture is an exact scale rendering of a GPS satellite crafted from steel with attention paid to recreating the smallest detail. This work has been made possible with the support of the Toronto Arts Council. Brandon Vickerd’s recent sculpture draws influence from contemporary mythologies and lowbrow sources, such as heavy metal music and comic books. Vickerd received his BFA from the Nova Scotia College of Art and Design in 1998 and his MFA from University of Victoria in 2001. Recent solo exhibition of his work include Dance of the Cranes, Nuit Blanche, Toronto, ON, 2009, Northern Satellite, Odd Gallery, Dawson City, YU, 2009. Recent group exhibitions include 2010, Tales to Astonish, Cambridge Galleries, Cambridge, ON, Here In My Car, Art Gallery of Windsor, Windsor, ON, 2010, and Screen 2010, VANOC Olympic Committee, Vancouver, BC, 2010.